How did Apple rebound from a decade-long slump? By creating a product - the iPod - that transformed not just the company, but the entire music industry. How did Whole Foods turn itself into a supermarket empire? By challenging the sacred cows of the food business. And how did Dove differentiate its line of beauty products? By creating the concept of "real beauty." 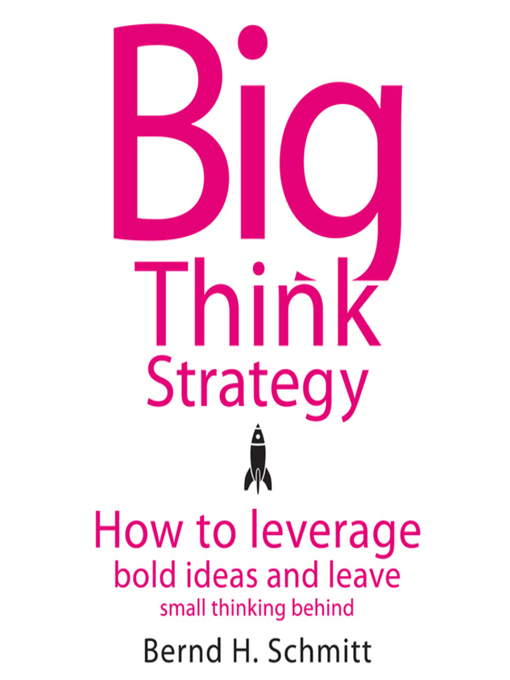 In Big Think Strategy, Bernd Schmitt shows you how to "think big" by sourcing and implementing bold ideas that change markets. We all know that businesses need creative and innovative strategies to compete. But as Schmitt points out, conventional corporate wisdom-which eschews risk taking and rewards small thinking-discourages the kind of bold thinking that is needed to change markets. Big Think Strategy is the antidote to such corporate inertia. Through business case studies and commentaries on cultural phenomena Schmitt uncovers the essence of bold leadership and the sources of revolutionary change. Schmitt carefully breaks down his approach to create simple tools that can be adapted and applied within any company. He gives step-by-step instructions for sourcing innovative ideas, evaluating them, turning them into strategy, and executing them, as well as how to establish organizational structures that will sustain long-term "big thinking" within your company. Schmitt's irreverent narrative style makes for lively, entertaining listening, as he draws on his diverse personal passions-steak, classical music, and good haircuts-to make his points. In Big Think Strategy, you will learn how to look outside the box for the bold, new ideas that will drive your firm's success.